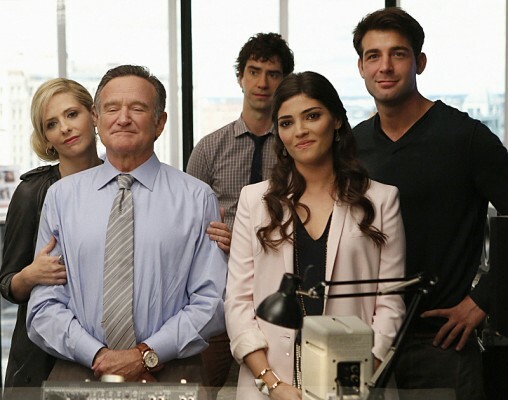 Performers include: Robin Williams, Sarah Michelle Gellar, James Wolk, Hamish Linklater, and Amanda Setton. In this sitcom, Simon Roberts (Robin Williams) is the head of a powerful Chicago advertising agency. He’s a genius at his job and uses his unorthodox methods and unpredictable behavior to land the biggest clients and brands in the world. Even more important to him is having his daughter Sydney by his side. Sydney (Sarah Michelle Gellar) is also Simon’s partner and his exact opposite. Eager to make a name for herself, she’s focused and organized. Unfortunately, she has to spend a lot of her time parenting her father. That would be a bigger problem if he wasn’t so brilliant at his job. Also working at the agency are dashing Zach Cropper (James Wolk); hardworking and neurotic art director Andrew Keanelly (Hamish Linklater); and Lauren Slotsky (Amanda Setton), the agency’s beautiful and deceptively smart assistant. With his team and his daughter behind him, Simon continues to set the advertising world on fire. When a corporation wants to buy out Lewis, Roberts+Roberts, Gordon calls in the board to vote, and Simon’s ex-wife and Sydney’s mom has the final say. What do you think? Do you like The Crazy Ones TV series? Do you think it should have been cancelled or renewed for a second season? AGAIN, FAB SHOW, FUNNY! I loved it. Williams was GREAT! Again, thank you network BABIES IN DIAPERS for cancelling it, and helping cause the death of one of 2 of the greatest comedians OF ALL TIME, you putzes. This show required intelligence to watch. I was so disappointed that it was cancelled. RIP Robin Williams……..God rest your soul. Dissapointed that the series was cancelled. Very funny show…i will miss Robin!! Saw it once, could not watch it – I don’t like that camera-moving style of filming. Can’t watch shows like that, they make me nauseous. God rest your soul. I love the show and if it had been renew he may still be with us. Robin you are missed. Funny show. Just heard it was cancelled. Disappointed that CBS didn’t invest more time into it. Completely loved the craziness of The Crazy Ones. Will miss the show and will miss its zany star.